Kokikai Aikido is a self-defense training system that stresses timing, centering and coordination rather than meeting force with force. The goal of Kokikai Aikido is to enable all individuals to reach their strongest state and realize their full potential, both in the art of self-defense and in their daily lives. 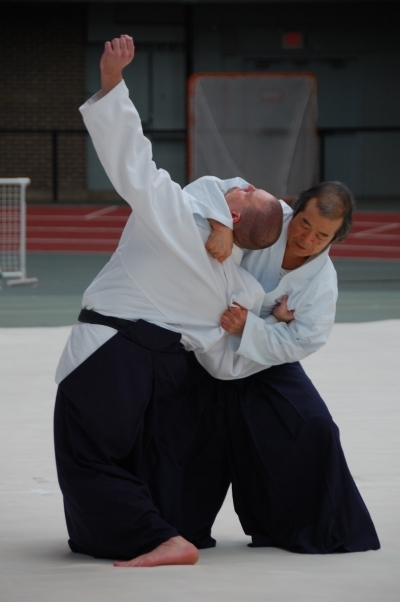 Most people associate strength with muscle power, but Kokikai Aikido students learn many ways to become stronger. Mind-body coordination, relaxation, good posture, and proper technique can increase any person's strength. In practicing Kokikai Aikido, students learn to coordinate mind and body, to respond calmly to conflict, and to "lead the attacker's mind." In this way they can use the minimum effort to create the maximum effect. This simple but revolutionary idea is at the heart of Kokikai Aikido principles. Because of these principles, Kokikai Aikido is an effective self-defense method for people of all ages and all physical types. It provides a path both for personal realization and for ethical self-defense. As students become stronger, they become more able to respond to conflict without aggression. This training can benefit their lives in a real, measurable way. Kokikai Aikido was founded by Shuji Maruyama Sensei, a lifetime student of the practice of aikido. Maruyama Sensei's teaching style is wonderfully dynamic, personal and exhilarating. He stresses that although aikido has deep roots in Japanese tradition, the practice must be relevant to modern life. His aikido technique is full of power and beauty. He encourages his students to grow and develop throughout their lifetimes, even as he continues to grow and develop the practice of Kokikai Aikido.